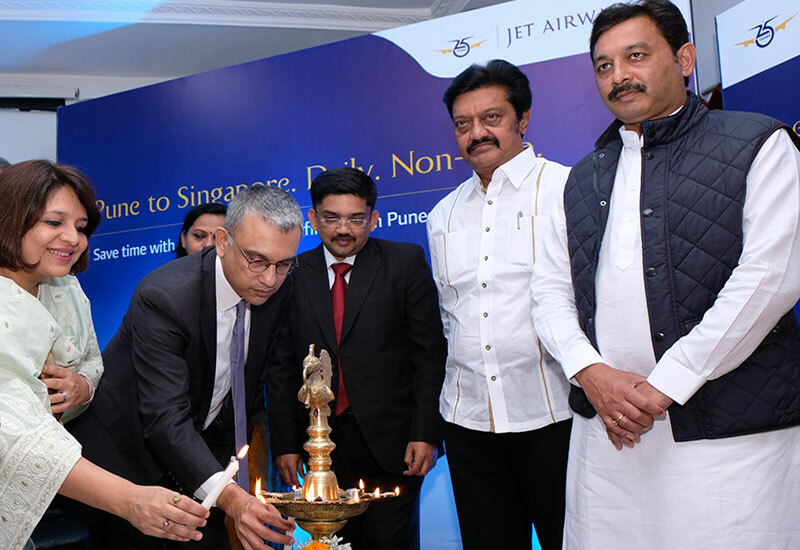 Pune, 30th November, 2018: Jet Airways, India’s premiere, full service international airline will launch its first daily, nonstop service between Pune and Singapore effective 1st December 2018, making it the first and only airline in India to connect the vibrant city of Pune with the financial hub of the East. Singapore saw over 36,000 visitor arrivals from Pune in 2017 – the highest for an Indian city without a direct service. Recognizing Pune’s potential as a leading business and commerce centre, Jet Airways’ new flight will further help expand the scope of traffic between Pune and the neighboring regions to Singapore. Travelers from Aurangabad, Ahmednagar, Sholapur, Kolhapur, Sangli, Satara, and Karad will find this flight convenient and an attractive option to connect on this flight to Singapore and to several cities beyond. Pune, known as the Oxford of the East, has rapidly transformed into a bustling economic centre. The key sectors of the local economy- education, manufacturing, tourism engineering and information technology (IT) will greatly benefit from this new flight and the connectivity it offers, contributing to further development of economic activities across the region. Singapore is a well-established financial hub of the East and an immensely popular tourist destination. This island nation with its tropical charm, tourist attractions, convention centres has attracted visitors from all over the world. Over the years it has grown in the fields of education and health – hosting some of the best educational institutes and hospitals in the world. The flight from Pune to Singapore, 9W 22 will depart Pune at 05:10 hrs (IST) with an arrival time of 13:15 hrs (local time) in the city-state of Singapore. On the return leg, flight 9W 21 is scheduled to depart from Singapore at 21:00 hrs (LT) and will arrive in Pune at 00:05 hrs (IST). On the eve of the launch of this inaugural service from Pune International Airport, Jet Airways conducted a multi-faith prayer followed by a ceremonial lamp lighting to mark the launch of flight 9W 22 Pune to Singapore. This inaugural lamp lighting function was led by Mr Vinay Dube, Chief Executive Officer, Jet Airways, and participating in the proceedings were esteemed guests, Shri Mr. Anil Shirole, – Member of Parliament Pune, Shri Sambhajiraje Chhatrapati- MP Rajya Sabha, Ms. Valsa Nair Singh, Civil Aviation Secretary, Government of Maharashtra, Shri Ajay Kumar – AAI Airport Director, and Mr. G.B. Srithar – Regional Director, Singapore Tourism Board. A host of dignitaries and special invitees graced the occasion with their presence. Guests can seamlessly connect onwards to 21 destinations across the Far East, Asia-Pacific region and Australia via Jet Airways’ codeshares and interline partners. Jet Airways will offer one stop connectivity through codeshare flights via Singapore to Auckland, Bangkok, Brisbane, Denpasar-Bali, Hanoi, Ho Chi Minh City, Jakarta, Kuala Lumpur, Manila, Melbourne, Shanghai etc. On board Jet Airways’ flight from Pune, guests will be able to experience our famed inflight product and services. On offer will be hours of inflight entertainment and programming which includes popular international and India blockbusters, shorts and TV series, an enviable audio compilation, while guests savour delectable Indian, regional and International dining options. Jet Airways has been at the forefront in developing business and trade relations between two countries. With the launch of this direct link, customers and exporters in Pune will seamlessly be able to ferry cargo goods to Singapore and neighboring Malaysia. Pune is known for its fresh fruit, vegetables which are popular export items and carriage of these perishable materials directly from Pune will save time and money for exporters. We are confident that this new connectivity will improve both export and import into Pune. To celebrate the launch of the new flight, Jet Airways has announced special ‘introductory’ return Economy fares from Pune, starting at INR 21,500 only, as also a Premiere fare of INR 65,500. These inaugural fares are applicable for journeys commencing from 01st December, 2018 onwards. Guests can also avail special fares for travelling to onward destinations such as Brisbane, Jakarta, Denpasar-Bali, Phuket, Kuala Lumpur, Melbourne, Nadi, Perth, Surabaya, Sydney and Darwin via Singapore. Beyond India, Jet Airways operates flights to key international destinations in South East Asia, South Asia, Middle East, Europe and North America. The Jet Airways Group currently operates a fleet of 124 aircraft, comprising Boeing 777-300 ERs, Airbus A330-200/300, the latest Boeing 737 Max 8, Next Generation Boeing 737s and ATR 72-500/600s.